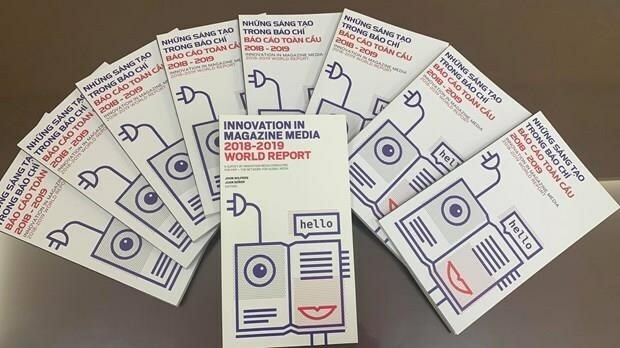 Hanoi (VNA) – The Vietnam News Agency (VNA) has published the Vietnamese-version of the Innovation in Media 2018-2019 World Report. The 9th edition of Innovation in Magazine Media World Report is produced by FIPP, a global trade association whose purpose is to improve all aspects of the media content industry through the sharing of knowledge, mutual cooperation, and strategic partnerships, in partnership with Innovation Media Consulting Group. The book serves as a useful handbook for media outlets' managers, reporters, editors as well as corporate communications practitioners in a fast changing world. With more than 60 media products made by more than 1,000 reporters and editors out of the over-2,300-strong staff, the VNA is the press agency with the largest number of information products and forms in the country, from source news in the forms of text, photo, television, infographics and audio to publications such as dailies, weeklies, magazines, pictorials, books, e-newspapers, websites, online and print newspapers, and information on mobile platforms and social networks, among others.